If your summer activity list is dwindling, now is a good time to look forward to some of the new goodies from perennial toy, book, and decor favorite Petit Collage. Coming in mid-August, Petit Collage will be releasing new designs for mini puzzles, craft kits, and adorable kiddie placemats. 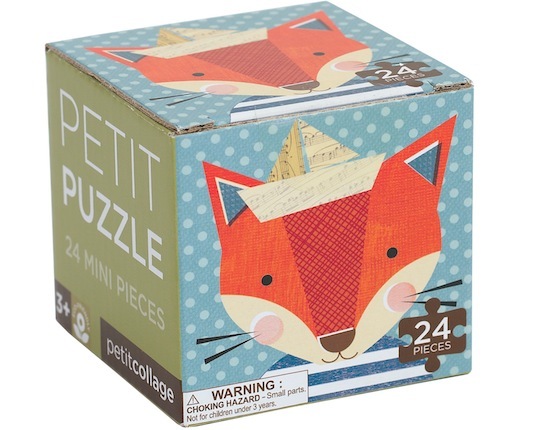 Featuring familiar and endearing monkey, rabbit, fox, and cats graphics, the new Petit Puzzles measure only 6” by 6” so they’re perfectly portable. For ages 3 and up, these boxed puzzles are a great big sibling gift, party favor, or even a handy tool to have in your bag when you need to kill some time. Plus, they are made from recycled paper and printed with vegetable-based inks. Petit Collage’s craft kits are all-in-one fun. 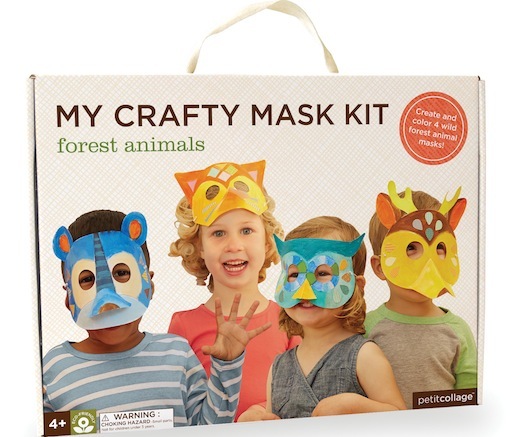 You can choose from a mask set or a collage craft box, both featuring various forest animals. The mask set comes with 4 masks, ready for assembling (no scissors required): kids can just color the masks, add stickers, and with a little grown-up help, will be ready for creative playtime. The collage kit is a great, non-messy art project for preschoolers — they can add stickers or cardboard shapes to four scenes. Eating out with little ones is often less relaxing than in pre-kid days. But Petit Collage has made dining a little more interesting for wee ones with their new wood-free placemats (also printed with vegetable based inks). In safari or ocean-themed sets of 36 placemats, we love how they offer activity suggestions while still allowing plenty of empty space for kids to doodle and create independently. Featuring familiar and endearing monkey, rabbit, fox, and cats graphics, the new Petit Puzzles measure only 6” by 6” so they're perfectly portable. For ages 3 and up, these boxed puzzles are a great big sibling gift, party favor, or even a handy tool to have in your bag when you need to kill some time. Plus, they are made from recycled paper and printed with vegetable-based inks. Petit Collage’s craft kits are all-in-one fun. You can choose from a mask set or a collage craft box, both featuring various forest animals. The mask set comes with 4 masks, ready for assembling (no scissors required): kids can just color the masks, add stickers, and with a little grown-up help, will be ready for creative playtime. The collage kit is a great, non-messy art project for preschoolers -- they can add stickers or cardboard shapes to four scenes. Eating out with little ones is often less relaxing than in pre-kid days. But Petit Collage has made dining a little more interesting for wee ones with their new wood-free placemats (also printed with vegetable based inks). In safari or ocean-themed sets of 36 placemats, we love how they offer activity suggestions while still allowing plenty of empty space for little ones to doodle and create independently.